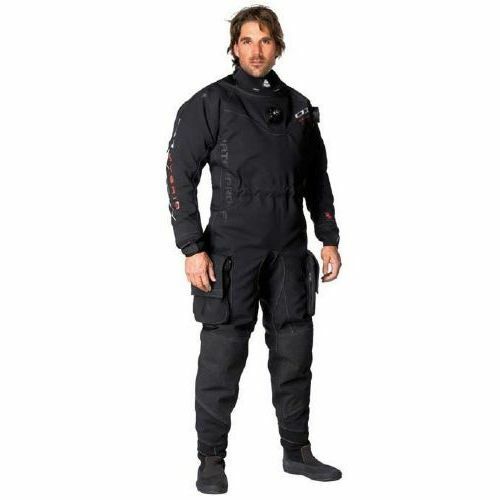 3 years of problem solving, material sourcing and intense testing finally gave birth to an innovative hybrid drysuit and Waterproof was able to patent a new diving revolution; the D1 Hybrid Dry Suit. The first suit ever with integrated silicone seals I.S.S. No more aborted dives due to seal rupture. You can change the seals on the spot in no time. Silicone offers great ozone, chemical and UV resistance paired with a high comfort factor due to its flexibility. Say goodbye to neck & wrist seal choke! In every aspect, more comfortable than traditional bulky underwear. The D1 Hybrid comes with the following inclusions: H1 5/7mm Venting hood, LP hose and valves, D1 Drybag, suspenders, one extra silicone neck and arm seal.